This post is part of the series When We Lead, which tells the story of how organizations rooted in communities of color are engaging their members on voting in the run up to election day. Sikh SOCH is a non-profit organization based in Kent, WA. We focus on empowering the communities around us through following Sikh principles. These principals include equality, justice, education, liberty and humanity. This group consists of local youth volunteers who work hard to educate the Sikh/Punjabi community about civil rights and engage them in volunteer opportunities. We hold quarterly volunteer events for our community to participate in. For example, we hold 2 street cleanups in a quarter in City of Kent with our volunteers. There is a lack of civic engagement in the Sikh community; so we have been working for the past year educating the community about their rights and duties as US Citizen. 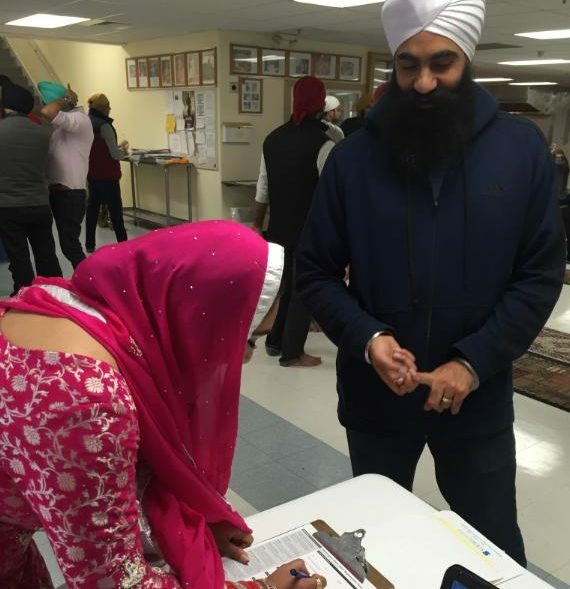 We register voters at 3 three Sikh Gurudwaras (temples) and a community school in King County. Gurudwaras are places of worship but also community centers where Sikh families socialize and receive information about many issues. Volunteers bring laptops and voter registration packets and register Sikh community members. We help answer questions regarding the ballot for the congregation. We have been holding ballot parties in at the Gurudwaras to educate the community. We have also provided translated materials for the individuals as needed. Sikh community has been in North America since early 1900’s. And there has not been much progress in getting them involved in political or community events. Our goal is to increase political involvement in our community. We want to increase voter turnout for Sikh community in King county. Sikh SOCH will focus on educating the community on how these decisions impact their daily lives. We want to increase confidence of our voters by empowering them with the right tools to make decisions. Our organization plans on hosting community forums and candidate forums in the future elections.